Anxiety and depression - felt lonely until Jeanne found community through WCH’s Behavioral Health Services. Jeanne (not pictured) had a wonderful life, with a loving husband, kids, and grandchildren. She was eager to help others, whatever they asked of her. But under the surface, she was dealing with depression, anxiety, and unhealthy boundaries. She struggled to get up in the morning, and sometimes just sat in bed, staring at the walls. “I spent probably a month crying almost every day,” she says. Referred by her family doctor and encouraged by her husband, Jeanne started an Intensive Outpatient Program through the Behavioral Health Services at Wooster Community Hospital Health System. “My first day, I was greeted by the receptionist with a big smile, and such warmth that I was drawn in,” Jeanne says. Three days a week, Jeanne attended group sessions that allowed participants to “check in” with each other and share their insights. She also had individual therapy sessions each week and medication management through the department’s psychiatrist. WCH’s experienced ER staff may have saved Brad Mullen’s life. They insisted on admitting him for chest pain, shortly before he suffered a massive heart attack. Everything has an expiration date and Brad Mullen will readily tell you his could have been June 26, 2018. But thanks to a thorough ER staff and a doctor who refused to let him leave the hospital, Brad is alive today to tell his story. Like a bad dream you can’t shake, Brad, of Wooster, remembers every detail of that fateful Tuesday. The day was warm and sunny, and he had a full schedule ahead of him. First on his plate was picking up a business partner at the Cleveland Airport. As he backed out of his garage and headed toward the road that morning, he felt a familiar pain in his chest – hiatal hernia. “It was like swallowing too many mashed potatoes too quickly,” he said. The last act he recalls is stepping on the brakes before he blacked out. Although he regained consciousness quickly, he realized he needed to get medical attention - and since his doctor could not accommodate on such a short notice, he reluctantly planned a trip to the ER and felt no real sense of urgency. He called a colleague to pick up his business partner and stopped to get gas on the way. Since he suffered from esophageal reflux, Brad was fairly certain that was the source of the pain. An EKG at the WCH ER showed no abnormalities, and his enzyme levels came back normal. Still, some pain persisted, and Dr. Alison Southern insisted he be admitted. “Call it intuition or whatever, she was adamant that I not leave,” he said. Thankfully Brad didn’t leave, because a short time later he suffered a massive heart attack, referred to as a STEMI (ST segment elevation myocardial infarction), “known as the widow maker,” said Brad. Had he driven to the airport, Brad is sure his business partner would have found him dead at the wheel of his car sitting in the arrivals section at Hopkins Airport. “People who suffer this type of heart attack generally don’t survive, I have come to understand” said Brad. It was during the admission process the event occurred. Brad explained, “The last thing I really recall is the overwhelming pain and telling my wife, ‘It’s different this time.’” At that moment, a code was called and the emergency response team descended on Room 126. Dr. Rehan, interventional cardiologist, and his support staff went into overdrive. He placed two stents in Brad’s arteries. After recovery, Brad began cardiac rehabilitation; and in July, he had two more stents inserted and made some serious lifestyle changes. Looking back, he recognizes that he had many risk factors for such an event. “I was diabetic, overweight, had high blood pressure and cholesterol, didn’t exercise much, and had a lot of stress in my life,” he said. “Now food is my fuel, I exercise daily and have lost 30 pounds.” Managing stress has been his biggest challenge. Brad is so grateful for the caring hospital staff at WCH that encouraged him every step of the way. One nurse even had the strength of character to push Brad on some difficult issues. “Nurse Debi was tough,” said Brad. “She told me that I had control issues and needed to make some changes. She was right,” said Brad. “Tough but caring, she sat and explained her observations and spent the time to provide guidance.” This was the first of many lessons to come. Debi was just one of the “fantastic” staff members at Wooster Community Hospital. He interacted with custodial staff, nurses, aides, and volunteers who all “went above and beyond” to make his hospital stay and recovery a good experience. He names them one by one: Debi, Brittany, Jo, Janet, Chad, Dr. Rehan, Dr. Southern, Dr. Moodispaw, Dr. Newton — the list goes on. Brad was so pleased with the level of care he received at WCH that he reached out to hospital CEO Bill Sheron, and penned his testimonial. Brad continues to work on his recovery, both physical and mental. He’s learning to appreciate each day God has given him as a “true gift.” He’s learning to “let go” of things he can’t control. And he’s happily sharing with everyone around him what a “gem” Wooster Community Hospital truly is. After suffering debilitating hip pain from arthritis, Carol Ohl became the first WCH patient to have both hip replacements done at once, thanks to a newer surgical approach. Carol Ohl is not one to shy away from a good challenge. At the age of 52 she went back to school to study art and eventually opened her own pottery shop on their 38-acre farm in Holmes County. She and her husband, Michael, were “living the dream” sharing their land with horses, goats and llamas when their life changed almost overnight. Carol woke up one morning to find her previously active and healthy husband “lying on the ground.” He had suffered a stroke at the age of 68 and Carol found herself in the role of caretaker. Carol and Michael moved to Wooster in the fall of 2016 to be near their daughter and better medical facilities. Michael’s 94-year-old mother joined the household shortly after. Carol is very glad they made the move when they did because a few months later, she was the one facing a health crisis. At the age of 74, her arthritic hips had simply “worn out.” Years of running, sitting at a potter’s wheel, climbing ladders and lifting heavy glazing buckets had taken their toll on her hips, and in the fall of 2017 the pain was “unbearable.” She found herself faced with another huge challenge. “I was given the choice to undergo two separate hip replacement surgeries or be the first at WCH to have one bilateral anterior hip replacement surgery,” she said. Carol turned to her two daughters, her “caring” orthopedic surgeon, Dr. Steven Widmer of Wooster Orthopaedics and Sports Medicine Center and the “supportive” staff at HealthPoint to get her through. “My two daughters took turns for about six weeks, mostly to care for their dad and of course baby me,” said Carol. Within a few months, Carol was back in her caretaker role and she is so grateful for the part WCH and HealthPoint played in her surgery and recovery. “They literally had me up walking the first day,” she said. Carol spent only two nights in the hospital and was rehabbing within a week. “I haven’t had any hip pain since,” she said. The muscles were a little slower to heal. Carol stays in touch in person and by text with her daughters, enjoys the good moments she has with her husband and lives with the assurance that WCH is close by should she need it. Pain management specialist Dr. Basali and spine surgeon Dr. Yu work together to provide treatment plans for patients suffering from back pain. 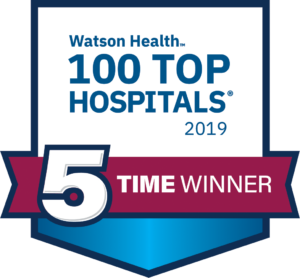 With physicians working closely together across disciplines, Wooster Community Hospital (WCH) Health System is able to provide patients with a wide variety of options for managing and alleviating chronic pain. Dr. Elizabeth Yu is an assistant professor in the Department of Orthopaedics Division of Spine Surgery with the Ohio State University Wexner Medical Center. Dr. A. Harris Basali is medical director of The Pain Management Institute, conveniently located at the WCH main campus. The two doctors join forces to offer patients the opportunity to look at all possible avenues available for the treatment and cure of chronic pain. “The collaboration with myself and Dr. Basali benefits our patients by maximizing all nonsurgical treatment options before surgery, if the patient is a surgical candidate.” said Dr. Yu. Local patient, Susan Lehman, experienced firsthand the benefits of the care available through this collaboration when she unexpectedly found herself experiencing chronic and severe pain. This type of procedure assists the surgeon in deciding what type of surgery may be needed, and improves the chances of successful treatment. Dr. Basali described three categories of ways his department collaborates with surgeons. “There is before – where we treat and maybe don’t need the surgery. There is diagnostic in preparation for surgery.” And if pain persists after surgery, the two collaborate on that issue as well. The procedure is called a minimal microdiscectomy. “She was able to go home the same day after surgery,” said Dr. Yu. When making the personal decision to have reconstructive surgery after a breast cancer diagnosis, three patients explain why they chose Dr. James Slaby as their surgeon. “I think every woman that has a breast cancer diagnosis should have an evaluation by a plastic surgeon to discuss her breast reconstruction options,” said Dr. James Slaby, plastic and reconstructive surgeon at Wooster Community Hospital (WCH) Health System. Dr. Slaby is known for his kind and caring manner with breast cancer patients who are seeking reconstruction. Dr. Slaby is also meticulous in making clear that a patient’s first priority is to take care of the cancer. Next, he stresses that whether or not to have reconstructive surgery is a very personal decision. Christine Schafrath is a patient of Dr. Slaby’s and has experienced firsthand his expertise and his personable bedside manner. “He made me feel so at ease,” said Christine. “He’s an incredible doctor.” After four years and numerous surgeries, Christine definitely knows her reconstructive surgeon. 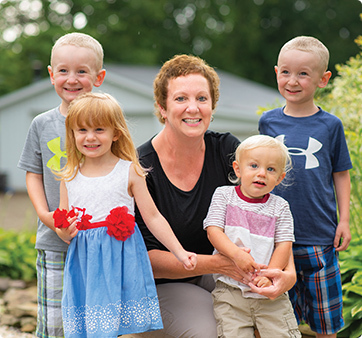 Christine’s journey with breast cancer began in 2013 with a lumpectomy and radiation. She had hoped it would end there. However, in 2016, she found herself facing a double mastectomy. Another of Dr. Slaby’s patients, Cyndy Maglio’s breast cancer story began in 2010. It started out in a familiar way – Cyndy was used to being sent for a recheck after her yearly mammogram. It was always nothing. This time? “I was told I needed to do a biopsy just to make sure,” she said. When Cyndy received her diagnosis, one of her sisters was being treated for non-Hodgkin lymphoma. She had already lost two sisters, her parents, and a grandparent to cancer. Part of Dr. Slaby’s knack of putting patients at ease is the fact that he encourages patients to contact him with any and every question. “I will help them decipher the information that can sometimes feel like information overload,” he said. With the help of rehab and regular doctor visits, David Fleming was able to vastly improve his lung function through WCH Pulmonary Services. It turns out those commercials were right – when you have chronic obstructive pulmonary disease (COPD), it does “feel like an elephant is sitting on your chest,” said David Fleming, of Rittman. And David should know; he’s been fighting that diagnosis for the past seven years. With grit, determination and the help of some “fantastic Wooster Community Hospital (WCH) Health System doctors,” David has turned what was a “death sentence” into a story of hope. David, who owned and operated Top Notch Painting for 25 years, first noticed symptoms of the disease in 2010. While he used to climb 40-foot ladders with ease, he began to feel “winded” when he got to the top, and it progressed to where he didn’t know if he had the energy to get back down. “I’d have to sit under a tree for a while to recover,” he said. Thinking it was a heart problem, David got checked out and was a bit surprised to get the COPD diagnosis. In the next few years, “it moved progressively and swiftly,” said David and by 2014 he was on oxygen full-time. His symptoms continued to worsen and he was assigned palliative and then hospice care. In 2016, he ended up with pneumonia in the WCH emergency room, but strangely enough, this is where he ended up with hope. He met Dr. Bruce Arthur and Nurse Practitioner Christina Muller and they changed his life. They worked with his medications and put him on a nutritional program so he gained weight, which allowed him to take part in the pulmonary rehabilitation program. In six months, his lung function had improved to where he qualified to be put on the waiting list for a double lung transplant. After a stroke and multiple surgeries, WCH’s Transitional Care Unit helped Bob Schmidt get the compassionate care and therapy he needed to get back to his daily life. The body has an amazing ability to heal itself. The liver and intestinal linings regenerate and the skin replaces itself daily. Yet, with certain injuries, the body becomes its own worst enemy. This was the case in Bob Schmidt’s life after he suffered a stroke at the age of 53 and found himself in a fight against his own body. Now, a “miraculous little pump” that drips Baclofen into his spinal cord is letting his muscles relax and work with, not against, his body. Bob’s story began last March, when the Wooster native was living a very full life. He enjoyed his job as a salesman for Dex Media and participated in many hobbies, including biking, bowling and playing soccer, tennis and golf. When he wasn’t participating in sports himself, he could be found cheering for Ohio’s many sports teams, often courtside. March of 2018 didn’t seem unusual except Bob had what he thought was a severe case of GERD. “It felt like really bad heartburn,” he said. The next day, he collapsed at home. What Bob thought was heartburn turned out to be an aortic dissection, and he was airlifted to an out-of-town facility. As the helicopter blades whirled in his ears, he was unaware how his life was about to change, and had no idea that he wouldn’t set foot in his home again for eight months. “Bob underwent a 9-hour surgery to repair the aorta,” said his wife, Brenda. He spent the next few days recovering in Cardiac ICU, closely monitored. Then, Bob suffered another blow. “He stopped responding to us, and tests revealed he had suffered an ischemic stroke,” said Brenda. His doctor recommended removing part of his skull to relieve pressure on the brain. Brenda and other close family members made the difficult decision to proceed, even though his chest cavity was still open and healing. “We really had no choice,” Brenda said. The next month was a blur of surgeries, a temporary tracheotomy and respirator, and waiting for his body to stabilize. After a few months in an inpatient rehabilitation center, Bob was moved to the Transitional Care Unit at Wooster Community Hospital. Bob was never so glad to see Wooster. Here, he had to relearn how to stand, walk and use his muscles. He also met physical therapist Kelly Yarman and Dr. Ayman Basali, a pain management specialist — two godsends who changed his life. “A stroke can affect the brain and block messages between the brain and muscles, which hinders the recovery process,” says Dr. Basali. This was the case with Bob. His muscle spasticity caused muscle stiffness and tightness that interfered with his ability to walk. “I had reached a plateau in PT and Kelli suggested I look at a Baclofen pump,” Bob said. In November, Dr. Basali inserted the pump under Bob’s abdominal wall. The pump began dispensing small doses of Baclofen to a targeted site in Bob’s spinal cord. “It’s an effective way to deliver the medication and can usually be given at lower doses than oral medication, which reduces side effects as well,” said Dr. Basali, currently the only doctor in the area who performs this procedure. Bob was finally able to come home in late September. He remembers it felt “fantastic” to cross the threshold of his home after being away for so long. He is slowly feeling the Baclofen relaxing his muscles. Kurt Gerschutz, his WCH Home Health physical therapist, works with him three times a week for an hour and a half. Bob is still working on walking normally. In particular, he has to retrain his left foot not to cross in front of his right foot. He is working with a speech and occupational therapist as well. While it’s all hard work, the “fantastic” staff at WCH and a “miracle” drug pump, gives Bob hope he will get his mobility and independence back. And he will never again take one day for granted. This past Thanksgiving, Bob celebrated his 54th birthday. While the past year has been challenging, Bob says there is much to be thankful for. He is grateful for his wife, who has been a stalwart at his side fighting for him the whole way. Family and friends have offered prayers, visits, meals and fundraisers. Slowly but surely, Bob is making progress. “I’m alive, I’m progressing and I have hope,” he said. Patients Terry Schenck and John Estill are thankful to have a Cardiac Device Clinic nearby, as WCH is the only facility in this area to offer such services. The heart is an amazing organ. Every 60 seconds, it pumps about five quarts of blood through a system of vessels that if stretched out, would be over 60,000 miles long. It beats about 100,000 times a day and continues its stealthy but steady work day and night. Aging or heart disease can damage your heart’s ability to regulate its pace. “A problem with the heart’s natural pacemaker or the wires carrying the impulses can cause a slow heart rate and can be a sign that your heart needs a little help,” said Sue Raber, RN, who has managed the Cardiac Device Clinic at the Wooster Heart Group since 2013. Sue is specialty trained in defibrillators and pacers and her expertise ensures that area residents no longer have to go out-of-the-area for pacemakers, implantable cardioverter defibrillators (ICDs) and follow-up care. These implantable devices need follow-up care, said Sue. “One to two weeks after the device is implanted, patients need to return for an incision and device check and for follow-up instructions. Every three to six months after that, the devices need to be routinely checked so adjustments can be made, if necessary. And Terry Schenck, of Wooster, is sure glad the Cardiac Device Clinic was there for him this past year. Without the pacemaker Dr. Cyril Ofori implanted into his chest last year, he’s pretty sure he wouldn’t have lived to see the new year. Terry, age 67, who has a history of longevity in his family, noticed his heart rate kept going down during the fall and he was feeling dizzy. When his heart rate decreased to 30 beats per minute he called Dr. Paul Moodispaw’s office and they scheduled a visit. A few hours later they called him back. “We need to see you tomorrow,” he recalled them saying. They scheduled surgery for a pacemaker to be implanted by Dr. Ofori. Terry had the surgery and went home the next day. “Terry was a good candidate for a pacemaker because pacemakers generally treat slow heart rates or uncontrolled heart rates,” said Dr. Ofori. “Immediately I felt great,” Terry said. “It was just a 45-minute procedure under local anesthesia. I was awake and joking with the staff before and after the procedure.” Four days later, it was no laughing matter. Terry and his wife were enjoying seafood at an area restaurant when he had an allergic reaction to the seafood. “I was shaking, started swelling up and had hives all over.” He went straight to the ER at WCH, where they diagnosed his allergic reaction and treated him. His blood pressure had dropped. “If I didn’t have the pacemaker in, I don’t think I would be alive today,” he said. “The pacemaker kept my heart rate up until I could recover.” He is very grateful to Dr. Moodispaw for recognizing his heart problem and getting him sorted out. John Estill of Millersburg is another patient who is grateful for the acute heart care he was able to receive locally. The retired systems analyst felt great until he hit his 60s. “Then my health started going downhill,” he said. He was diagnosed with type 2 diabetes in 2001 and shortness of breath followed. A longtime smoker, he gave up smoking and did fairly well until a heart catheterization in 2003 revealed stenosis in his heart passageways. He had quadruple bypass surgery in 2003 and continued to be monitored over the next few years by Dr. Ofori. In 2015, Dr. Ofori, who noticed John’s “heart muscle was very weak after his heart attack and bypass surgery,” suggested it was time for an implantable cardioverter-defibrillator (ICD). Two bouts of pneumonia finally convinced John to get the implant. He had it implanted locally by Dr. Emile Daoud from The Ohio State University. Dr. Daoud is chief of electrophysiology at OSU and collaborates with the Wooster Heart Group physicians. He has been implanting defibrillators at WCH for more than seven years. Dr. Oleghe not only treated Julia Blaker for an infected foot at the WCH Wound Center, but helped her improve her life in general. Every once in a while in life one has an “epiphany” moment. It happened to Julia Blaker last fall in Dr. Efewongbe Oleghe’s office at the Wound Healing Center where she was being treated for an infected foot. While Dr. Oleghe gently removed the dead skin layers from her toes, she suggested that perhaps there could be a connection between her ailing foot, Julia’s diabetes and her overall health. “Through her gentle questions and my answering honestly, I was slapped in the face with the fact that this could be where my problems stem from,” said Julia. “I just didn’t connect the two before.” What a difference that “connection” has made. Julia’s story began in November 2017 when she and her husband, Larry, set out to visit her daughter and grandson in Connecticut. They spent much of their time together in the hotel pool. While her foot was “swollen and sore” when she got there, by the time they left for home it was unbearable. “I was curled up in the back seat sleeping most of the way home,” she recalls. By the time she got to her previous physician, her vitals “were not good. My blood pressure was high and I was afraid I would lose some of my toes,” she said. Her doctor put her on strong antibiotics and sent her to the Wound Healing Center, where she met Dr. Oleghe. As soon as she met Dr. Oleghe, she agreed with her husband that she was “in good hands.” Dr. Oleghe did a culture on the foot and diagnosed a fungal and bacterial infection, perhaps something Julia had picked up in the hotel pool. And that was when Dr. Oleghe suggested there may be a connection between Julia’s diabetes and her foot problems. “She felt the diabetic medication I was on was not working well for me and said I should consider changing or adding another medication,” said Julia. Julia was eager to see what she could do with diet and exercise and while Dr. Oleghe had some concerns, “she was definitely my advocate to give it a try.” Julia’s husband was also a huge support. In less than a year, Julia lost 70 pounds and learned how to better control her blood sugar and blood pressure with food and exercise. Today, her foot is back to normal and she feels better than she has in years. She and Larry are enjoying time with family and friends, gardening, working outside on the family farm in West Salem where they live, and traveling for work and pleasure. She credits Dr. Oleghe for her amazing journey of discovery and recovery. “I know I wasn’t, but I felt like I was her only patient,” Julia said. Julia can’t say enough good about Dr. Oleghe. She was so impressed with her that she took her on as her primary care physician. Yet Julia has learned the lessons of self-responsibility as well and has some “tips” for others struggling with health issues. “First, it is very important to find a doctor that you feel is your partner and advocate. Listen to their advice; then ask yourself the hard questions of what steps can I take to start improving my health? A less-invasive wound vacuum procedure helped Gary Klepper avoid surgery for a deep wound in his calf. Gary Klepper believes in angels, because he’s seen them at work in his life this past year. They took many forms: his wife who called 911, his neighbor who responded to his cries for help, a doctor who let him try and heal a gaping wound without additional surgery or skin grafts, and especially the “fantastic” home health staff who took his calls at all hours, day and night. And, true to their name, they made house calls! The alert did its job and Gary’s wife called 911. A neighbor heard him call for help and came and wrapped a towel around his leg to stem the bleeding. Medics arrived within 10 minutes, recalls Gary. They whisked him away to the WCH emergency room where he required surgical intervention and received 48 stitches in his calf. After that, it was up to Gary to clean and dress the wound and watch for signs of infection. Two days later, Gary said he “could smell the wound and the gauze felt wet to my touch and I knew it was infected.” Back in the emergency room, they removed his stitches, cleaned out the wound and made another game plan. Gary met with Dr. James Slaby, who specializes in wound healing and plastic / reconstructive surgery. Instead of pushing for another surgery and skin grafting, Dr. Slaby was open to trying a wound vacuum, or vac, procedure. The challenge was that the procedure required multiple visits to the wound center each week, but Gary had given up driving a few years back. That’s when the “angels” in WCH home health came on the scene. The home health staff came out three times a week to check on him and change the dressings. Any time Gary had questions or concerns, they were there. “I remember calling them in the middle of the night with questions,” said Gary. “If we couldn’t get it figured out over the phone they’d say, ‘I will be right there.’ And they were — at any time of the day or night. They were also quick to notice when something didn’t seem right. On one visit, his nurse had a feeling “there was just something wrong,” said Gary. He hadn’t been feeling all that great and it turns out he had a temperature and cellulitis and was back in the hospital for four days. In addition to home health visits, Gary met with vascular surgeon Dr. Larry Stern and his staff weekly. Dr. Stern and his workforce were “always knowledgeable and pleasant,” said Gary. His last home health “angel” visit was in September, and Gary is feeling pretty good right now. He is back to walking his corgi shepherd daily, enjoying his family, taking care of his two-acre property and feeding the birds. “I probably go through 400 to 500 pounds of bird seed a year,” he said. When you’re young and athletic and you’ve never been sidelined for anything serious, six to nine months off the field or court sounds like an eternity. That’s exactly what Zoe Chamberlin and Taylor Boley thought when each of them suffered a torn ACL (anterior cruciate ligament). Yet time has given them a little perspective. They’re both glad they listened to orthopaedic surgeon, Dr. Anne Marie Chicorelli, and stayed the course until the healing was complete. For Zoe, the “accident” happened in her 8th grade year at Wooster High School during a lacrosse game. Dodging an opponent, she caught her foot in a hole and heard a “snap.” Nothing a little ice, rest and ibuprofen wouldn’t cure, she thought. However a week later during a tournament in Medina, “I was running and it just completely gave out,” said Zoe. “I knew something was really wrong.” An MRI revealed a torn ACL, and Zoe felt her world collapse. “I wanted to make varsity in high school and work toward a college scholarship,” she said. “I cried a lot at first because I knew that my season was over.” When she met with Dr. Chicorelli, she found her to be a “straight shooter. She was very up front with me and told me that it would be six to nine months before I was back on the field.” But she was also very encouraging, Zoe said. “She wasn’t going to release me until I was ready.” That meant months of hard rehabilitation but in the end, it was worth it. Taylor, of Creston, grew up with three older brothers and sports were a part of her life from the get-go. In 4th grade she started organized sports by joining a softball league. From there she progressed to soccer, cheerleading, basketball and volleyball, her first love. During a basketball game her sophomore year at Norwayne High School that she tore her ACL while coming down from a fade-away shot. Her trainer did a quick check on her in the locker room, but it wasn’t until she tried to run down the hall to get back in the game that she realized something was really wrong. “I couldn’t run,” she said. Taylor had surgery in January of 2017 and sat on the sidelines for the rest of the season. “Watching them play without me was awful,” she said. A few weeks after surgery, the “fun”started. Next year Taylor will be playing volleyball at Alderson Broaddus University, where she received a generous athletic scholarship. Even minor illnesses can spread rapidly through a school, causing missed class and unhappy children. So when Lindsay Miller’s six-year-old son Jett came home with pink eye (or conjunctivitis), she knew she had to act quickly. Unfortunately, she could not get a doctor’s appointment until the following day, and Jett would have to miss school. Unlike many kids, Jett did not want to miss school that week. It was May, and he was looking forward to a special Mother’s Day event that his class had been preparing. “When I told him he would be missing a day, he cried and cried,” Lindsay said. A friend suggested WCH Health System’s telemedicine service, WCH TodayCare. So Lindsay downloaded the app, created a profile, and she and Jett met with a doctor on her phone. The doctor confirmed pink eye after examining Jett through the phone’s camera. He ordered a prescription, which Lindsay was able to pick up that evening. Jett did not have to miss the Mother’s Day event, after all. “I think once I downloaded the app and started talking to someone, start to finish it was about 10 minutes,” she said. For more information about how the health care teams at Wooster Community Hospital may be able to help you, call (330) 263-8144.